Futureproof your network for ever-increasing Ethernet speeds with the blue Cat 6a Snagless Patch Cable from Pearstone, as it comes rated to 500 MHz and is capable of transmission speeds up to 10 Gb/s. The durable and heavily jacketed cable has a length of 14', is suited for commercial use, and meets or exceeds all Cat 6a standards, making it a viable solution to wire a home, office, or entire building. Due to the greater transmission speeds, the Cat 6a cable is a step up from Cat 5 cables in reducing the crosstalk and interference that can slow the speed of your network. To further minimize crosstalk, the Cat 6a cable is constructed with an internal nylon spline that separates and isolates the four twisted pairs. Gold-plated RJ45 connectors assure reliable conductivity and enhanced Ethernet speeds while resisting corrosion. The snagless boot design will withstand wear and tear under the most demanding conditions. Gold plating enhances conductivity and assures fast data transmission speeds. Gold Connectors are also noncorrosive for long cable life. 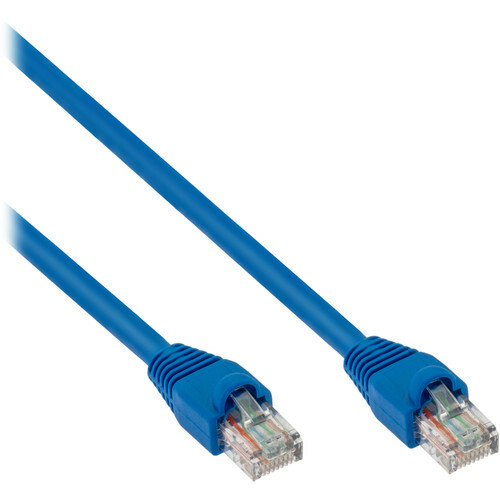 The Cat 6a cable is capable of 10 Gb/s data transfer rates and has a 500 MHz rating which is perfect for connecting to 10-Gigabit networks. Upgrading to a Cat 6a patch cable will help to futureproof your network for increasing transmission speeds. The bare copper conductors are tightly twisted to minimize RF and EM interference and near-end crosstalk that can slow down the speed of your network. For additional rejection fo unwanted interference, the cable is constructed with an internal nylon spline that separates and isolates the four twisted pairs. This feature offers additional network speed for data-intensive applications like streaming video. A cable's release tab is something you never think about until it catches on something, or if it breaks. The cable's boot offers strain relief and covers the tab, so you can smoothly pull the cable through a bundle without snagging. Flexibility and durability are important when selecting patch cables because you need them to flex, bend, and withstand frequent connecting and disconnecting. This cable is constructed with a bare copper stranded conductor that allows you to flex the cable as needed. The PVC jacket is durable enough to withstand heavy use. To make sure all your cables don't look alike, and so you don't use the wrong cable, Pearstone offers a wide variety of colors for easy cable identification. Box Dimensions (LxWxH) 5.8 x 4.7 x 1.2"